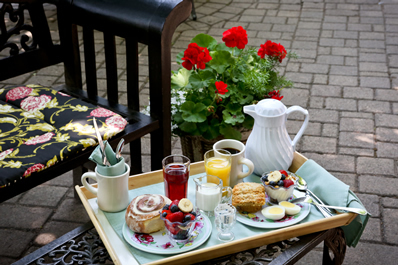 The Breakfast Menu includes your choice of time, place and what you would like to enjoy that morning including bakery, fruit or a yogurt parfait plus the usual breakfast extras. Our lovely Garden Courtyard, yours to enjoy throughout the day and evening and it is also where most guests like to have their breakfast. Refrigerator, ice machine and instant hot water with teas and coffee.